Chickweed (Stellaria media), from the Carnation family, is one of the most common weeds found. Chickens and love it ‑ hence the name ‑ but it is good for any type of pet bird. Pigs like chickweed, as do rabbits. Cows and horses will eat it, but goats won’t touch it. Chickweed has shallow, fragile roots so it is easy to uproot it accidentally but it will recover if replanted immediately (this may be the distinction between weeds and non-weeds). The stems mostly trail along the ground. The leaves are oval and succulent in pairs opposite each other. 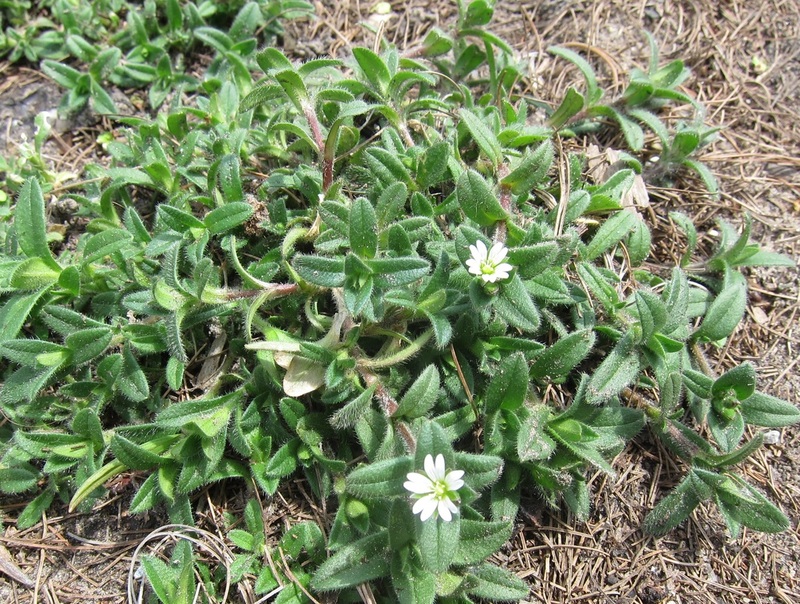 It has tiny white star-like flowers about a quarter inch in diameter. The flowers have five petals but the petals are so deeply notched that it looks like there are ten. The flowers close at night or when it is about to rain. On the other hand, you may be asking, why would I even think of eating this weed? Here is one reason: chickweed is very nutritious. It is high in vitamins and minerals -- particularly vitamin C. It also provides niacin, riboflavin (B2), thiamin (B1), beta carotene (which converts to vitamin A), magnesium, iron, calcium, potassium, zinc, phosphorus, and manganese. It even contains protein. Eating a vast quantity of chickweed may cause diarrhea, however. Some people even use it medicinally as a mild laxative. Other medicinal uses are as a diuretic or as an expectorant. As such it's been recommended for asthma, bronchitis, or congestion. A tea made from dried chickweed helps sooth a cough or hoarseness (see the recipe below). Another use for the tea or any water in which chickweed has been boiled is to sooth and moisturize irritated skin. When applied to the skin it will soothe itching, minor skin infections or inflammation. It is an actually an ingredient in some commercial skin care products. This infusion should be stored in the refrigerator. Boiled in lard it makes a green-colored cooling ointment for hemorrhoids or sores. Chickweed fights infection but is gentle enough to use on eyes. To relieve discomfort of conjunctivitis (pink eye), crush a handful of chickweed leaves and place it on closed eyelids, then place a warm, wet washcloth on top. Chickweed has even been said to help control obesity but that is probably just old wives’ tale (perhaps related to the laxative effect!). I’d say don’t try this at home. I want to add a disclaimer: I’m only reporting what people say about this weed. I’m not endorsing any magical curative powers. My dad was a doctor and I’m a firm believer in modern medicines. I just think it is interesting to learn about the herbs (or weeds as the case may be). Besides, you never know when you may marooned on an deserted island and be forced to live off the land. The easiest way to harvest chickweed is with scissors, just trim the top off and leave the lower portion to continue producing, should you so desire. If you harvest more than you need at one time you can store the leftovers in the refrigerator because it is one wild green that keeps fairly well. Or you can compost the leftovers and go back out and weed your garden again when you need more. If for some reason you don’t have any chickweed in your yard, I’m sure any neighbor would be happy to allow you to “harvest” it from their garden. Chickweed leaves and stems can be added to salads or sandwiches – anywhere you might use any other green like lettuce or spinach. The taste of raw chickweed as been described as as "similar to corn silk." This description is just not appealing to me because I usually try to remove all the silks from my corn before I eat it. People also say that when it is cooked it tastes somewhat like spinach. I would say that unless you eat it all by itself you will not know what it tastes like. Most of the recipes combine chickweed with several other ingredients, many of which are fairly strongly flavored and overwhelm the flavor of the chickweed. You get the health benefits…you just can’t taste them. Mash the eggs with a fork and mix in mayonnaise and mustard to desired consistency. Stir in the chickweed and chives and season with salt and pepper. Mix the dressing and refrigerate for a few hours to allow the ingredients to blend. When it is time to serve the salad, toss the chickweed greens and feta cheese together. Add the dressing just before serving. The original recipe had 3 Tbsp of lemon juice to 1½ Tbsp of olive oil. It was a very strong lemon flavor. I served it to my mother who said politely, "It's good...but I don't think I'll ask for the recipe." Mix together all ingredients in a large casserole dish and bake, covered, at 350º for one hour or until the vegetables are tender. (This was less colorful after it was baked). Pour eight ounces of boiling water over one tablespoon of dried chickweed (or two tablespoons of chopped fresh chickweed) and let it steep for ten minutes. Drink ½ cup two to four times a day during a cold or flu to alleviate congestion. (Note: you must chop the chickweed to get the benefit when you are just steeping it and not boiling it). In a food processor or blender purée chickpeas and chickweed. Add remaining ingredients and process until smooth. Add the reserved liquids as necessary to get the consistency you like. Serve with crackers, pita or bread. Fry bacon until crisp. When it is cool, crumble or chopped it and measure ½ cup. Set aside. Beat the eggs until lemon colored, then add sour cream, flour and nutmeg. 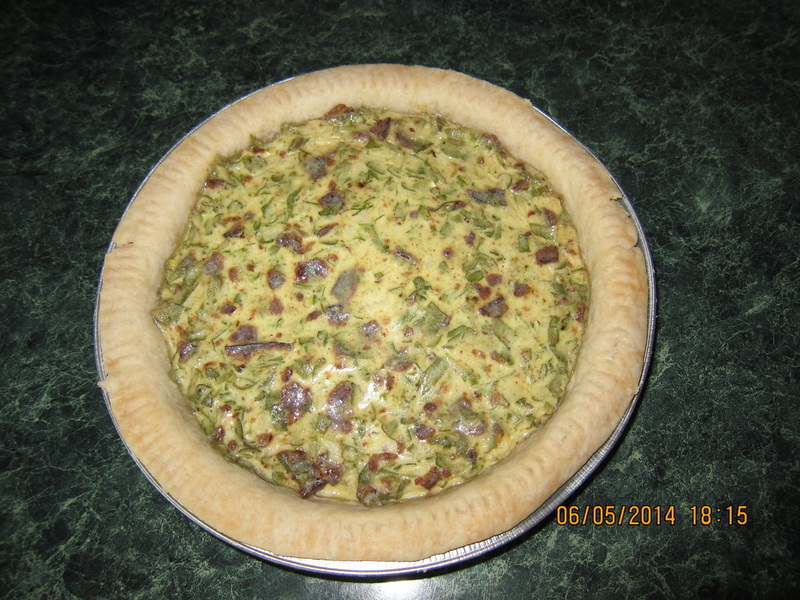 Stir until combined then add chickweed, onions and bacon and spread filling evenly in the pie shell. Bake for 45 to 50 minutes at 325°, or until pie has set in center and top looks golden. --Adapted from Pennsylvania Dutch Country Cooking by William Woys Weaver (Abbeville Press, 1993). I liked this. It tasted like quiche. I thought I'd miss the cheese but the sour cream must have taken the place. Again, the chickweed was there, but we couldn't really taste it. Joel's assessment: "How can you not like something that tastes like bacon?" My biggest complaint about chickweed is that when you have a lot of little tiny hairy leaves that grow along the ground it is really difficult to get them clean enough to eat. 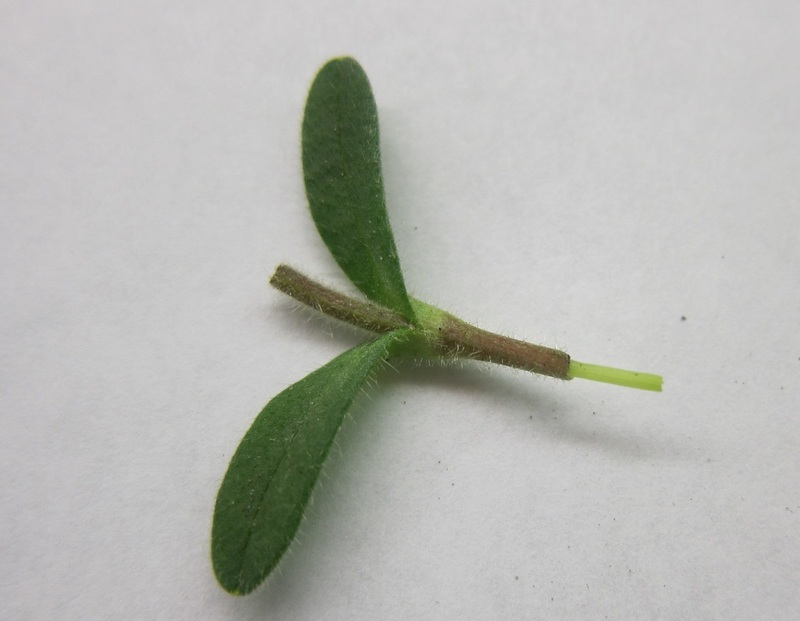 We liked everything I did with it and it's good to know about the plant, but I think I will remove my chickweed patch from the garden now that the experiment is done.